The Multi Oven oven allows simultaneously cooking of tasty pizzas and delicious food in a few minutes. All with one machine and only 35 inches of space. Thanks to a bottom support in the lower chamber inside the Multi Oven, an additional new refractory stone can be added to the oven, converting it from a 2 chamber oven into a 3 chamber one. 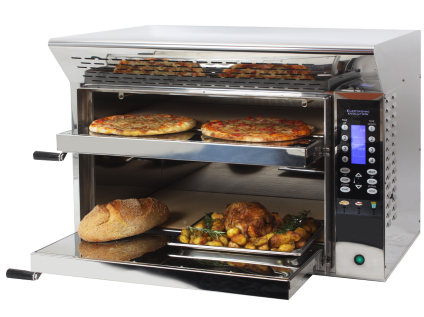 This option makes it possible to cook up to 6 pizzas every 2 minutes, ideal for cooking gluten-free pizzas with fresh dough, as well as pre-cooked and frozen pizzas, guaranteeing no gluten contamination from other ovens used improperly. The Multi Oven has 2 baking chambers of different sizes. The upper chamber measures 26 inches in width, 16 inches in depth, and 3.5 inches in height; the lower chamber measures 26 inches in width, 16 inches in depth and 9 inches in height. Up to 2 pizzas can be cooked at the same time, and in just 2 minutes. The lower chamber has also been designed for the quick preparation and cooking of various foods. Indeed, measuring 9 inches in height, it is possible to cook food such as whole chickens, bread, roasts, cakes, donuts, capon and of course other delicious gluten-free foods. Thanks to its revolutionary baking capacity, all the cooked food comes out as crisp as if it was baked in a real wood oven, without removing any moisture from the food. High performance oven with reduced energy consumption. Thanks to its power and ability to mantain constantly high heat in its chambers, the Multi Oven ensures the finest quality, most delicious food. Additionally it also offers exceptional performance with very low power consumption. The Multi Oven pizza and gourmet oven, as well as the entire range of Evolution pizza ovens, are also equipped with an activated carbon aspiration hood that eliminates fumes and any other unpleasant odors. Ovens reach a maximum temperature of 840 °F and this is why great attention was dedicated to the choice of stainless steel. Indeed, over time the oven's high temperature can hurt the consistency of normal steel used by the vast majority of ovens on the market. Instead, our steel and the structure of our burners is designed to allow great reliability over time, ensuring the same temperature isolation from the first day of use.